Strobe Security Solutions is a leading security company specialising in the installation and maintenance of audio and video intercom systems. We provide complete intercom systems and services for residential and commercial buildings throughout North Wales. Intercom systems allow apartment tenants and commercial security staff to communicate with visitors, manage deliveries, and control access to buildings. They are a vital feature of any secure building. 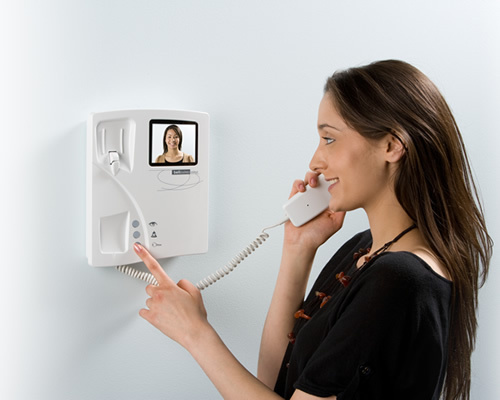 All intercom systems use audio to allow visitors to speak with residents, and today more and more intercom systems feature video to improve both communication and security. We install, repair and upgrade many different brands of intercom systems such as Paxton, Fermax, Videx, Bell, Aiphone and many other leading brands. We can provide DDA compliant dual height intercom systems – these meet the requirements of the current Disability Discrimination Act. The complexity of your system will depend on the size and layout of your home or business. Because of this, installation is a complicated process that requires specialised skills and a professional touch. This is precisely what you get when Strobe Security Solutions installs your system. Our Intercom Systems are available in North Wales (Anglesey, Conwy, Denbighshire, Flintshire, Gwynedd and Wrexham) and Chester.